Matrix Hog Floors | Drader Manufacturing Industries, Ltd.
Don’t want to spend all your time cleaning or replacing your barn floor? Our Matrix Hog Floors are easy cleaning, durable for the rigours of daily production, and have a life expectancy longer than any other barn floor on the market. One of the simplest purchasing decisions for your barn will be the barn floor when you discover Matrix Hog Floors. They offer the value and benefits that few other similar products offer. 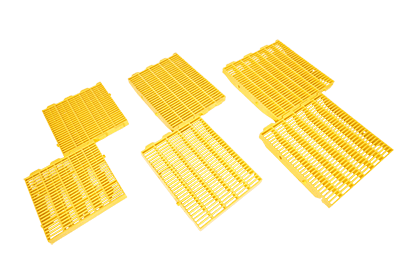 Matrix Hog Floors are strong and durable to withstand the rigours of daily production, are easy to clean and create a comfortable environment for your livestock. The Matrix Gold rotating panel design makes it easy to install and engineered Button-lok system keeps panels securely in place. The 100% virgin, high-impact polypropylene supplied by top resin producers means you spend less time replacing broken panels and more time raising hogs. Make the investment once! Saving money on a cheaper floor could cost much more in the long run. No inserts are required to fit panels directly against walls. Radius corners and unique web design do not allow manure to accumulate: cleaner panels means less bacterial growth and pigs thrive better in a healthy environment. Matrix Gold is strong and durable yet the high percentage of open area ensures proper manure flow through. Made from 100% virgin, high-impact polypropylene supplied by top resin producers. Do you want a panel that can rotate for quick and easy installation? If a panel breaks, do you want a floor that will allow you to easily change it out? Do you want your floor to be made from 100% virgin, high-impact plastic resin? Do you want to have a floor with a Leading Edge option? Do you want a floor that is designed to be comfortable and safe on the pig’s feet? Will your floor come with detailed installation instructions? Will your floor clean easily?